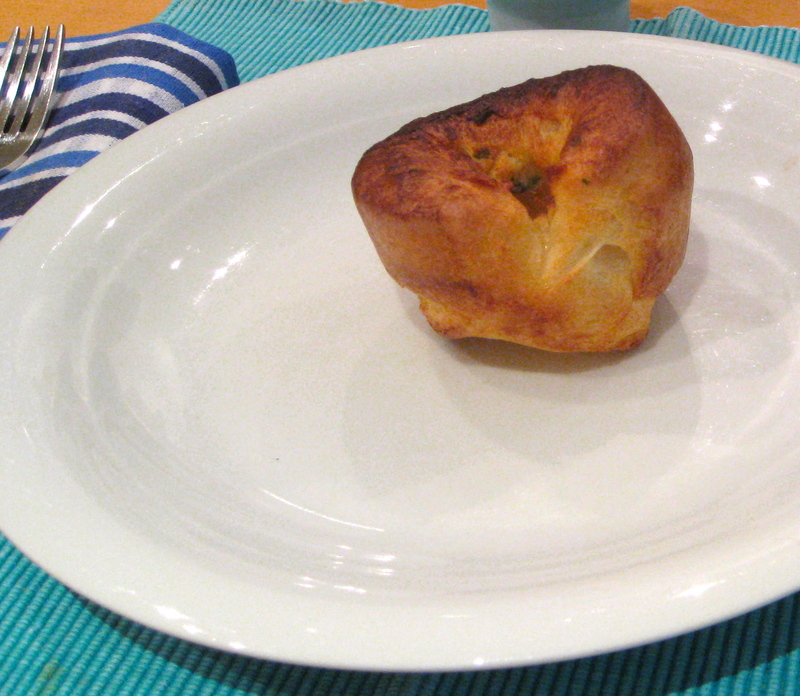 Have you ever had a popover? If you haven’t, you’re in for a crunchy-fluffy treat. I have long been familiar with the soft, moist eggy-ness of popovers, thanks to Pie in the Sky, the incredible bakery from which my family has breakfast almost every morning during our yearly two-week residence in Woods Hole, MA. Here in London, we finally got a muffin tin, and what better way to inaugurate its use than by attempting to make popovers myself? It was a relatively successful attempt. Like soufflé, popovers don’t have any leavening/rising agents, yet the magical combination of eggs, flour, milk, salt, and butter somehow allows the little guys to puff up beautifully. Mine ended up sinking a bit in the middle, but they still tasted awesome. 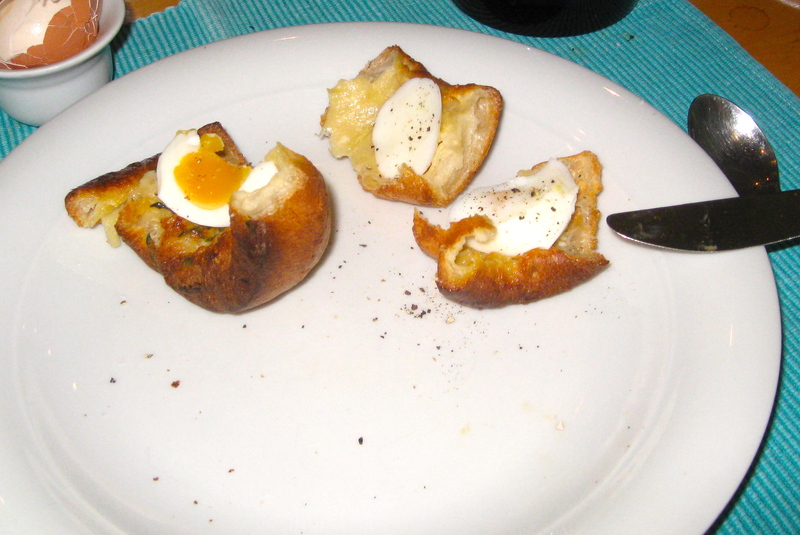 We enjoyed the popovers with butter, jam, and soft-boiled eggs. This recipe comes from The Kitchn‘s “How to Make Popovers” tutorial (gosh, I love those tutorials — they make it so easy to cook things that once seemed complicated). I added a few chopped chives to the batter for a little color. Next time I may try making cheesy popovers. 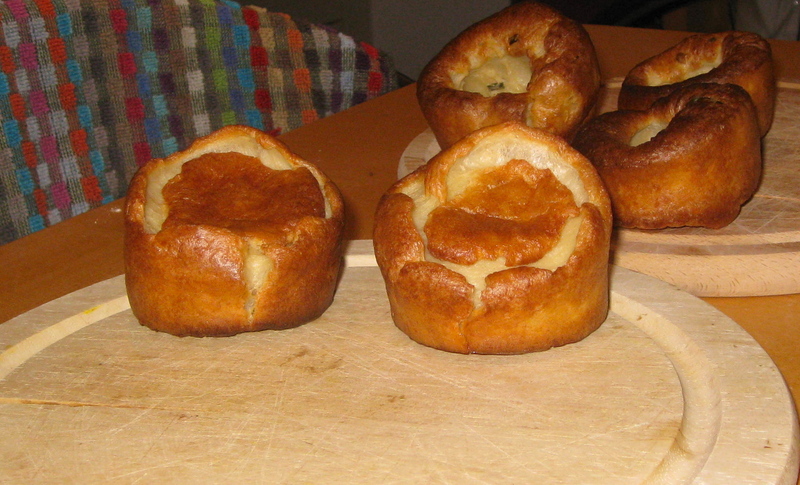 How do you like to make and eat your popovers? Melt the butter and whisk 1 tablespoon of it into the milk and eggs. Reserve the rest of the butter for later. Whisk the flour and salt into the wet mixture until smooth. Preheat the oven to 450F (230C) and let the batter sit while the oven heats. When the oven is hot, stick the muffin tin in it for 1 minute. Remove the tin and divide the remaining butter between the cups. Whisk the batter again until it is bubbly, then fill each muffin cup halfway. Bake the popovers for 15 minutes, then turn the heat down to 350F (175C) and bake for 10-15 more minutes. Do not open the oven while the popovers are baking! Popovers are best eaten warm, with butter, jam, or an egg, though you can reheat them later. This entry was posted in community, family, food, pictures, recipes, travel and tagged breakfast, brunch on 14.06.2013 by taplatt.